Kia has done a lot over the last few years to make you forget they were pushing the Sephia less than 20 years ago. Stuff like the big and expensive K900 has helped shed the crap car image. 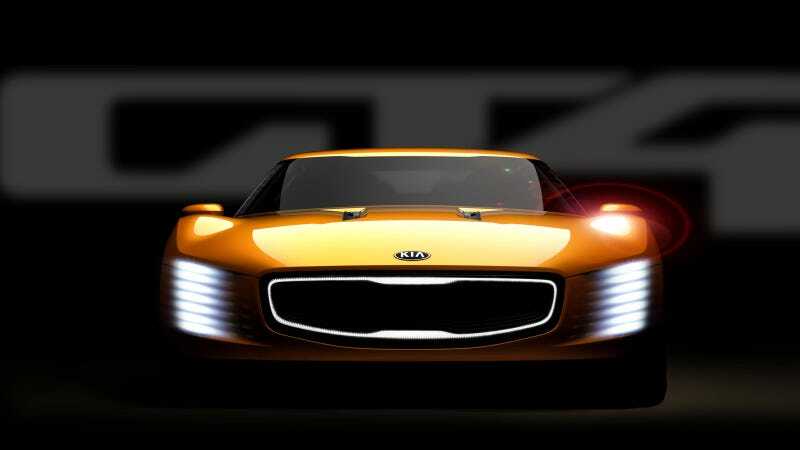 But a rear-wheel drive sports car could be the Kia you actually want to drive. If they build it. The previously unnamed concept outline will be called the GT4 Stinger, and is still slated for a showing in less than two weeks at the Detroit Auto Show. If you think the front looks like an Audi, you'd be right, partly because it's been smothered in LEDs. A 2.0-liter turbocharged four provides 315 horsepower directed towards the rear wheels, which is how Kia says implies it's ready for the track. The fact the Hyundai-Kia parts bin includes both a rear-drive coupe platform and 2.0-liter turbo fours makes the possibility of some production GT4 somewhat reasonable. And if they manage to make the front of it look anything like this concept, they'd be off to a really good start. Now if they could only do something about the K900's name.